Our Journey: Handmade Tavel Toys! I absolutely love creating, sewing, and crafting toys and clothes for Kelty ... and all kiddo's actually! My most recent project for Kelty was a set of travel toys to use during our trip back to the states (8 hour flight + 17 hour drive) ... then repeated on the trip home! These projects were really easy and really quick ... each one was sewn during Kelty's naptime ... no patterns, just winging it! I'm not a fan of patterns ... unless it's clothes ... or aprons! Wrapped up and ready to go .. both of these are compact enough to fit nicely into a diaper bag. The Doodle Wallet also fits well in a purse! I hand-cut a few felt scenes ... Kelty's favorite is the Itsy Bitsy Spider (I'm a little proud of the spider!). I sewed 2 pockets along one edge for easy storage and easy access for little hands. A tree with movable apples ... oranges were "stored" in the pocket. Every little boy needs a tractor, bus, and cars! All of the vehicle parts are glued on. Maybe the tractor is Kelty's favorite come to think of it! So ... if you want me to post a little tutorial just let me know ... I'd love to share! If you can sew a pillowcase, you can make these ... really! Love these! I wish I had your talent. You are so talented,and you crack me up. I wonder if anyone else noticed that the crayons in the pockets were all colors that matched or blended well with the fabric. Oh, I think the stickers coordinate quite well also. I'm soo impressed with your arts and craft skills you definitely got all that from mom! Did you get the orange he left, it's not on the fridge so i'm assuming you did. very cool..i'd try to make it but have no reason to..
Those are AWESOME! Please tell me your going to sell them on Etsy! I have a bunch of felt stories (from teaching) and love the idea of the felt mat that folds up. SO impressed! good work! Look at the crafty little mommy you have turned into. And to think I can say I knew you when. Kelty is lucky to have you. Wow! Those look great, now I need to make some!! I found your blog through Blue Cricket Designs... LOVE the doodle wallet. My 5 and 7 year old would LOVE this for in the car. I would love to see a tutorial!! If you do, will you post a quick comment on my blog just to make sure that I don't miss it?? GREAT ideas!! I LOVE it!!! Are you going to sell them on etsy??? I would love to buy one for Isabella and one for Gabriele!!! Let me know!!!!! SO cute! This would be perfect for my boys when they are sitting in church. I'd love a tutorial! (or I'd buy them if you start selling them). Please do a tutorial! I love that this one is for BOYS! Please, please, please post a tutorial!!! I have never sewn anything before, but my kids would love to have this in the car!!! Love this! They're so cute yet also every bit is practical. I'm curious about the age of Kelty. I'm thinking ahead to our 10 hr travel day home for Christmas and wondering if it'll be age appropriate for my daughter. I would love to see a tutorial on the doodle wallet. Super cute! I was wondering what kind of felt you used for the mat. Does it matter? I wanted to make some paper dolls for a cousin and thought this felt mat would be a base and carrying case. Thanks so much for the tutorial on Imperfectly Beautiful! Any felt will do; this was a "craft felt" that I purchased a few yards of. Thanks for checking out the tutorial and making you way over to my blog! 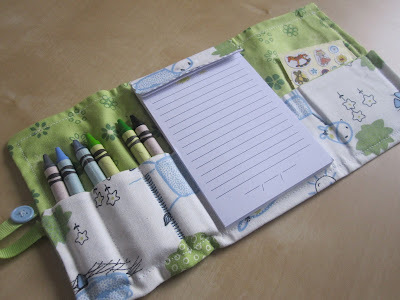 love the felt mat tute, how about one for the doodle wallet? Hi, i just came across your blog. Such a lovely handmade toys. just got back from a 12 hour road trip with 2 toddlers...this would have been AWESOME on the trip! Can i get the tutorial for the doodle wallet and felt boards? sakari720@yahoo.com THANKS! I would love to get the tutorial for the doodle wallet and for the felt wallet as well if I can! jessyp2009@aol.com. Thanks so much! I just found you while I was looking for things to do on a road trip. Could I please have the tutorial for each ~ bevyismomof4@yahoo.com Thank you! Such great ideas--I made a version of your travel wallet and did a tutorial on my blog, and my kids (ages 2.5 and 4.5) both LOVED them! Kept them busy on our 5-hour car ride and we've been using them all over town since getting back! Thanks! I'm KING of the Mountain!